BANGUED, Abra – From arms to amity. The Office of the Presidential Adviser on the Peace Process (OPAPP) and the Armed Forces of the Philippines (AFP) proposed the formation of the Peace and Development Forces (PDF) to former Cordilleran rebel groups as part of the peace agreement between the government and the Cordillera Bodong Administration-Cordillera People’s Liberation Army (CBA-CPLA) on Wednesday morning. 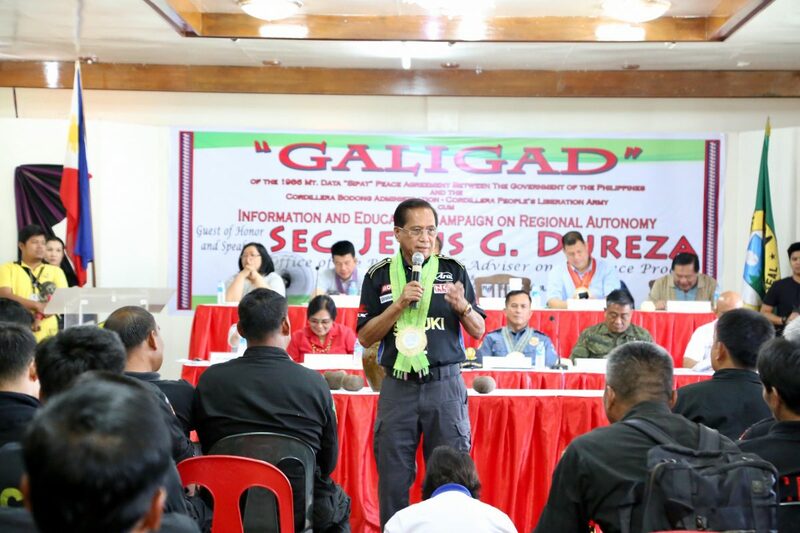 During the “Galigad” or a ceremonial cessation of hostilities presented by the CBA-CPLA Balao-as faction, Presidential Peace Adviser Jesus Dureza along with AFP-Peace Process Office Chief BGen. Raniel Ramiro suggested the process of decommissioning of firearms as an initial step to the eventual creation of the PDF towards the normalcy of former rebel groups in Cordillera. “Puwede yung mga baril ninyo hindi i-surrender at ipapa-inventory lang natin sa military kasi ang military ang custodian (ng firearms). Inventory muna, lista, and then i-deposito na muna. Pagkatapos, mag train kayo gaya ng mga army reservists. Pag tapos na kayong mag-training at qualified na kayo, puwede na kayong ipasok doon sa agency as reservists of the military,” Dureza suggested. The event, in partnership with the Regional Development Council (RDC) and the National Economic and Development Authority – Cordillera Administrative Region (NEDA-CAR), also featured the information and education campaign on Cordillera Autonomy. Marissa Cabato of NEDA-CAR said the campaign is still open for changes and interested individuals may submit contents to be included in the IECs subject to the evaluation and approval of RDC and NEDA-CAR. On January 17, Senator Miguel Zubiri fulfilled a recent promise to the Cordillerans by filing Senate Bill 1678 or an Act Establishing the Autonomous Region of the Cordillera. 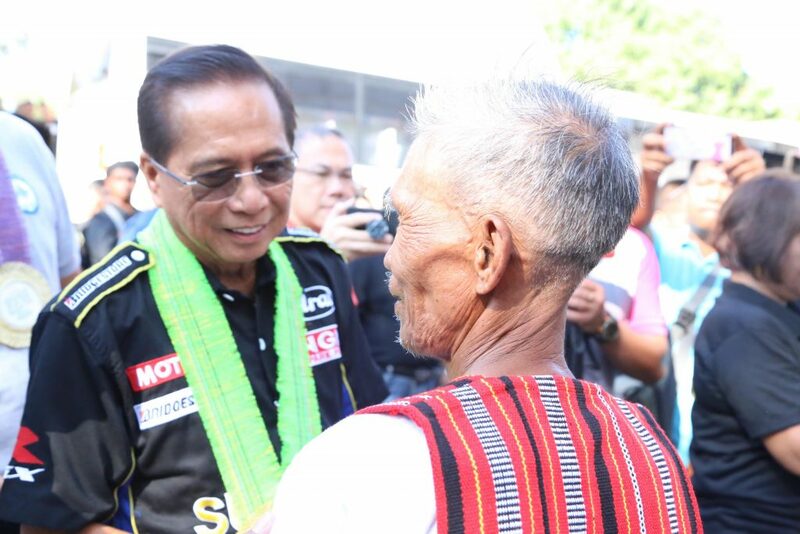 Zubiri is among the senators supportive of the Bangsamoro Autonomous Region and the Autonomous Region of the Cordillera. The bill also aims to address underdevelopment and poverty in the Cordilleras more effectively through regional autonomy. Last year, leaders and representatives of various Cordillera rebel factions and other groups, namely the CPLA and CPLA-CBA, Cordillera Peoples Alliance (CPA), Cordillera Broad Coalition (CBC), Cordillera Regional Consultative Commission (CRCC), and North Luzon Coalition for Good Governance (NLCGG), jointly called on all Cordillerans to unite and rally behind efforts to establish the constitutionally mandated Autonomous Region of the Cordillera.